A 4-piece drum miking strategy that's great for live sound reinforcement. This DP-QUAD 4-piece drum mic kit from Audix contains the D6 bass drum mic, the i5 instrument mic and 2 ADX-90 condenser mics. While some drummers prefer close miking every mounted tom and floor tom, a compelling case can be made for the 4 piece miking strategy. The D6 is a great bass drum mic that sounds great wherever you place it, the i5 picks up the snare with crisp attack and full body, and two overhead ADX51s do a great job of picking up the toms, hi-hat, and cymbals. This 4 piece pack comes equipped with stand adaptors and individual pouches for each microphone. 1 x i5: The i5 works for snare (top or bottom) and toms (it is also an excellent mic for instruments or guitar cabs). It features a protective steel grill, is easy to set up and use, and has a clean accurate sound. 1 x D6: The D6 works for kick drum, floor tom, djembe, cajon and other low-pitched percussion instruments. It features extended low end for larger drums, accurate frequency response, natural sound. 2 x ADX51s: The ADX51 is designed to capture the acoustics of the instrument being miked while at the same time isolating it from the rest of the instruments on stage. It is especially suited to extended mid and high frequency signals. 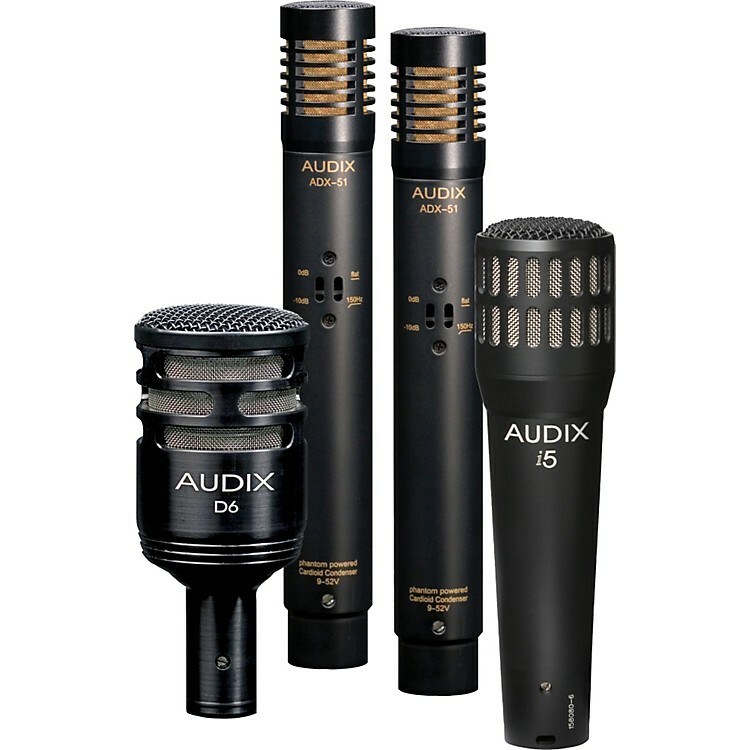 Enhance your live drum sound with this simple, yet highly effective mic kit from Audix. Order today! Cast Zinc Alloy housing with Black E coat. Brass housing with Black E coat.